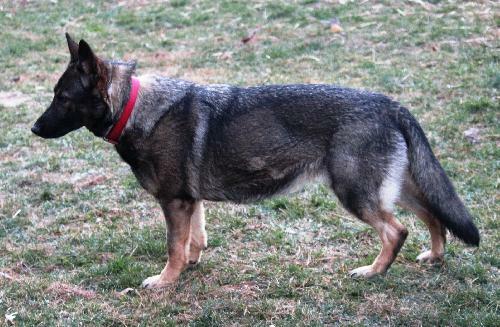 In all of my reading about German shepherds, I keep getting confused about the different coat colors and markings. I forget what “sable” means, what “black and red” looks like, and all the other labels in between (“saddle” versus a “blanket” pattern? I don’t know). In an effort not to sound like an idiot when I do talk with the rescues, here’s my little bit of research on GSD markings. This is the official AKC standard for the GSD coat and markings. Some, especially those with white GSDs, obviously take issue with this standard, but that’s another debate for another time. Here’s a sampling of the different coats I’ve found, doing my best to rely on examples from the rescues I’ve applied to. If you live in the area, maybe one of these dogs will speak to you! Most of the ones below are up for adoption! Black and red tends to be a more popular coat color in Europe, I’ve heard. I think it’s very beautiful and rich-looking. 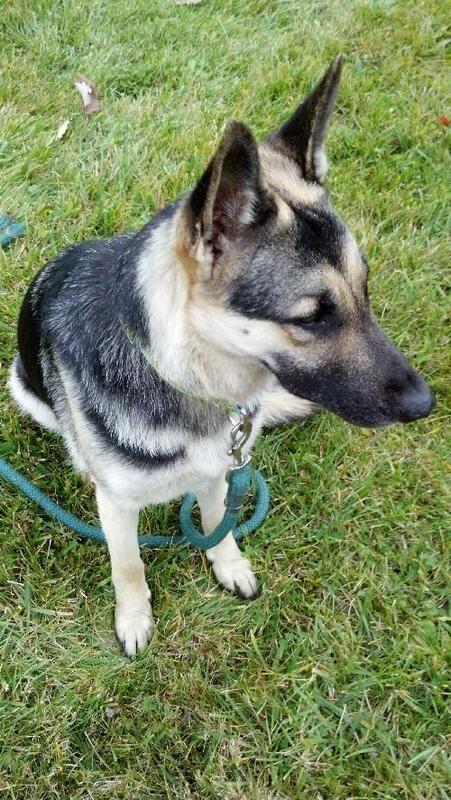 These dogs are Zeva and Layla, who were both adopted through Southeast German Shepherd Rescue. Our dog Pyrrha is a classic black-and-tan. She has a very traditional (for U.S. GSDs) coat pattern. The tan, as you can see, is quite light. She has almost a full saddle (the black pattern). There are plenty more photos of Pyrrha and her coat pattern on this blog, obviously! Black and cream tends to be more diluted than the tans and reds, clearly. (Pyrrha is almost a black and cream, and I think she could become one in her old age.) This is Jadyn, who was adopted through SGSR, too. OK, I am not an expert, obviously, so I have trouble distinguishing between black and cream and black and silver. This long-coat is apparently a black and silver. What do you think? Can you tell the difference? OK, here’s where I need someone more experienced to explain. Is there any difference between “bicolor” and the other “black and [other color]” patterns? I feel like the bicolors usually have little eyebrow markings, but I don’t really know. This dude is Brando, our first foster from Southeast German Shepherd Rescue. You can see the brown points on his legs. Xander, recently adopted through SGSR! These dogs are Xander and Enya, who were adopted through SGSR. I’ve tried to remember this pattern as “the wolf pattern,” because sable GSDs make me think of wolves more than anything else. I’ve come to really love this coat, too. For whatever reason, sables look extra-intense to me, even more than your standard black and red/tan. 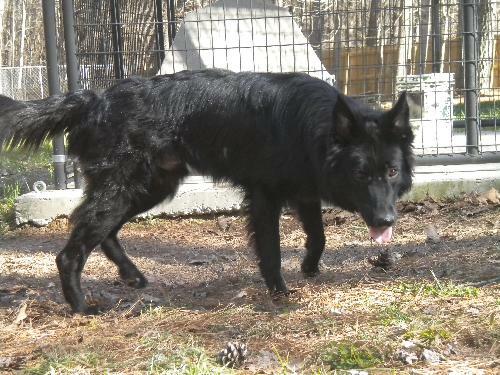 You get the idea: Solid black coat, no other markings. He looks so sleek. 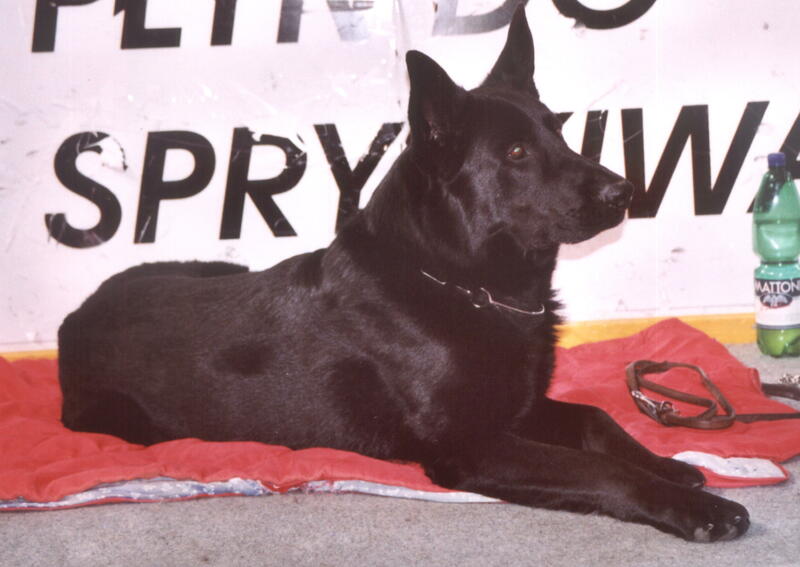 Many people are surprised to learn that GSDs can come in all black, with no markings at all. 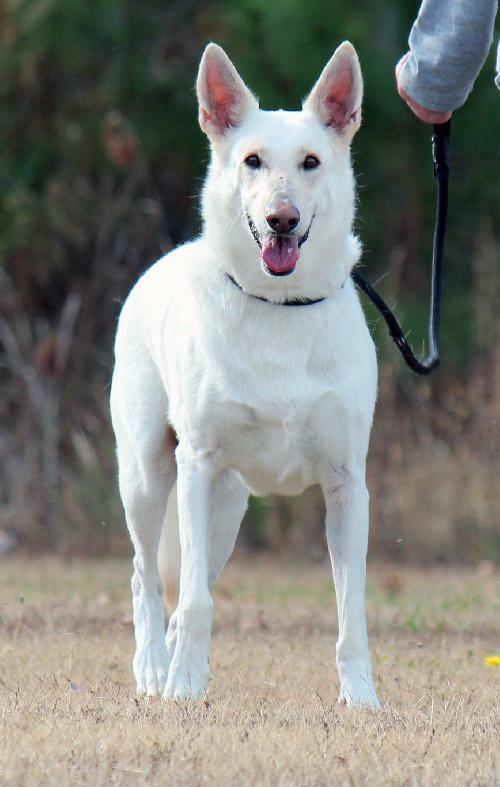 Solid white GSDs are considered a fault in the AKC and cannot be shown, but I think they are quite beautiful. This is Dakota, who was adopted through SGSR, too. L to R: Blue GSD, blue Belgian malinois, and blue Dutch shepherd. Photo from Cher Car Kennels. OK, couldn’t find any gray/blue dogs up for rescue, so this is a photo from Cher Car Kennels. Gray and blue dogs are considered serious faults according to the AKC standard. I know these are three different breeds, but I think the only dog I could correctly identify as “blue” would be the Dutch shepherd on the far right. I think I would have missed it in the GSD and malinois. How about you? Have you ever seen a blue GSD? 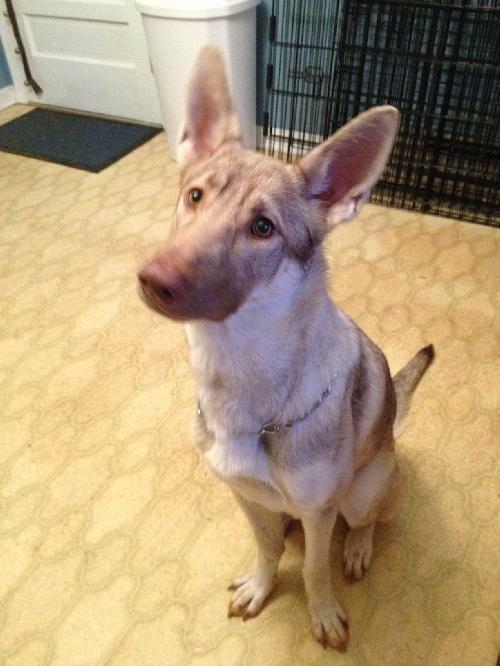 Quinn is a beautiful liver-sable girl who was adopted through SGSR recently. Isn’t she striking? This is a very rare coat pattern and is generally considered a fault in AKC standards. 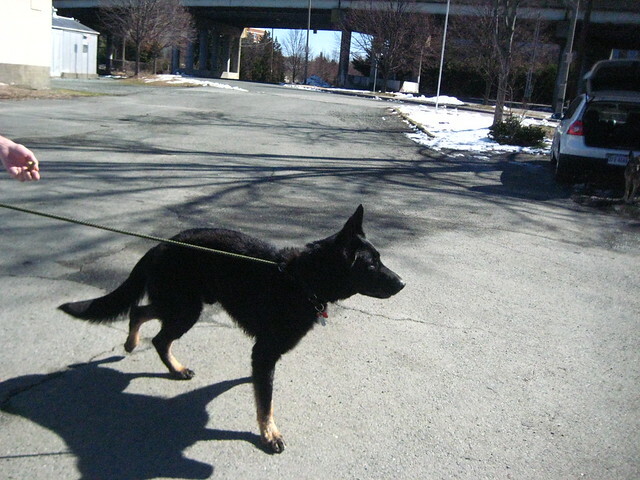 And this is Marli, a liver GSD, also adopted through SGSR. And, of course, don’t forget the long coats! 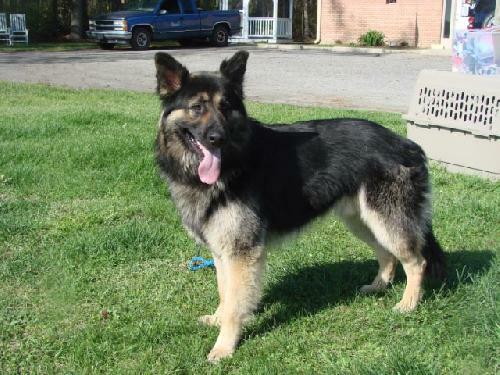 The following dogs were all adopted through Southeast German Shepherd Rescue. I love the diversity of coats and colors in the shepherd. I think many people are unaware that they can come in so many different colors! More on saddles versus blankets and masks here. 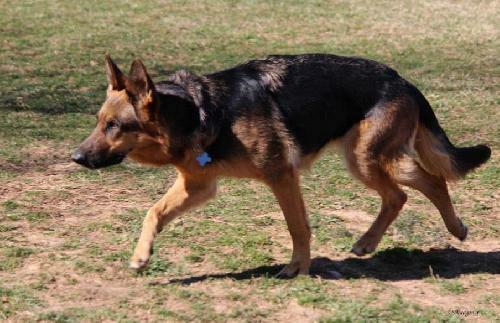 A serious and genetics-heavy discussion of coat colors in the GSD; very comprehensive! 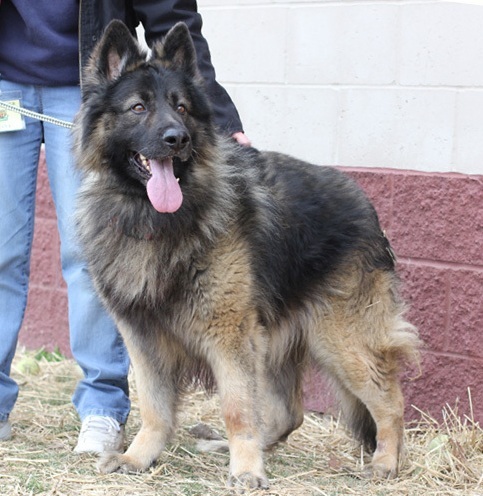 BrightStar German Shepherd Rescue also has a comprehensive, but layperson-friendly overview, with photos, of the coats and colors. Absolutely LOVED your write up on German Shepherd’s! They are truly beautiful and intelligent looking dogs! 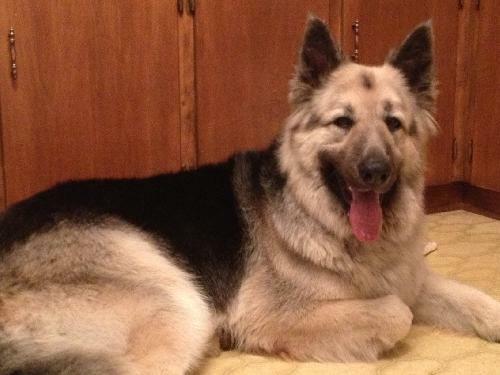 Our dog, Nikita, is part Akita and German Shepherd, but she has more of Shepherd look in her. She is very loyal and family oriented, and a great watch dog too! Check out her blog when you get the chance! By the way, I have never seen a GSD with blue eyes either, it definitely must be part Husky! Great Post! I have never before seen a German Shepherd with blue eyes, holy smokes! She’s beautiful and a bit startling! I like the black and red as well. 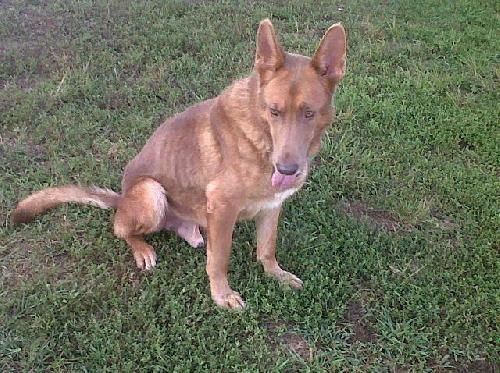 I wonder if it’s because with my “black and tan” Doberman, “tan” is really “rust” and so more like red? The paler ones (tan and then cream) just look kind of faded to my Doberman schooled eye. Sable is also very cool. I think that comparing it to a wolf coat makes some amount of sense. SGSR incorrectly identified Marli as a Liver (with red) He’s actually an Isabella, which is very rare in GSDs, much rarer than Liver. Isabella is the blue gene diluting the liver masking gene. A: Liver is NOT a masking gene. WGSDs are more commonly referred to as expressing a masking gene. Liver blocks any and all black pigment on the dog. It does not mask other colors\patterns like white does in GSDs. B: Marley is most certainly not an Isabella. He also doesn’t appear to be purebred but it’s difficult to tell with that photo. The color and quality of that photo are so poor it is impossible to tell if he has a black nose with faded pigment (modifier unrelated to the liver gene) or a dark brown nose. If it’s the latter then he is genetically “bb”. Not sure if my eyes are playing tricks on me or if there is just some distortion, noise, or other type of file corruption, or if he actually does have what appears to be a white line of fur running the outsides of his ears. An obvious huge white chest patch is not hard to miss but again, not sure if I’m seeing this right, but his paws appear to show white socks that are covered in liver\red spots. It appears as though he is expressing Ticking ontop of what is quite obviously the white spotting gene. Everything I just mentioned can be found on GSDs except for the Ticking. Not the type of ticking that describes silver hairs running the back of their necks and down their backs, but spots of color. That type of ticking does not exist in the GSD breed which would of course mean that Marley is a mix. Also note the tufts of white hairs coming from his tail. My first assumption would be this is just more of the spotting series although it normally expresses itself as a tip on their tail if it is present on a GSDs tail. However in light of the fact the chances are very good Marley is a mix, it could be the result of any number of modifiers. I have a (GSD) that has an all tan muzzle, was told she is pure bred but does the lack of a black mask keen she is mixed? I am buying 2 dogs from a breeder. The 1 has a tan face with no black markings o. The face but does have the black saddle and german shepherd face shape. Do you agree this is a full blood? Hi, Sonia! 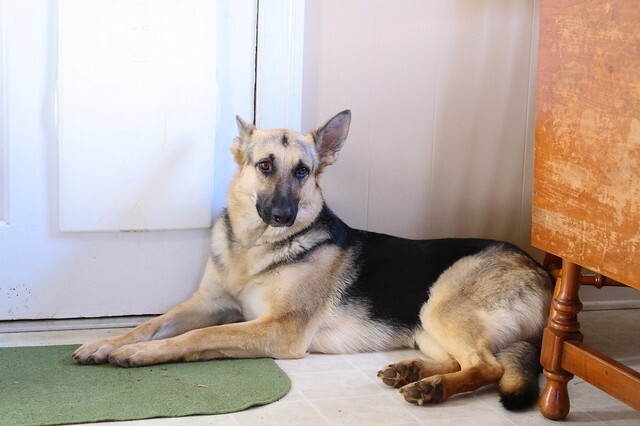 The only way to determine if a German shepherd is purebred is if the breeder has legitimate papers (either pink papers, from a German kennel, or AKC/UKC papers). Good luck to you! I’m not sure that I have, but it could be possible. More than anything, though, I would say that the quality of the breeder and the health and soundness of the dogs matters more than whether they are purebreds! Ohh, Wow! The red / liver sable is amazing!! I recently adopted a GSD that looks identical to the first pic. People have asked me if he has rottie in him. *raises eyebrow* Question is based on what exactly? LOL Zeva could be Tyson’s twin sister. I have a black/tan German Shepard but a newborns dog mated with her he is a white GS what will the puppies look like.